Please contact Ramsey Care at 1 (888) 227-3223 or info.general@daveramsey.com to purchase. Foundations in Personal Finance: Middle School Edition is the premier curriculum for teaching financial literacy. The six-chapter curriculum is easy to use and completely turnkey. The video lessons are taught by nationally known financial experts Dave Ramsey and Rachel Cruze, along with dynamic youth speaker, Anthony ONeal. The curriculum is hosted by acclaimed interviewer and broadcaster, Ken Coleman. Each chapter is stand-alone and can be easily adapted as a supplemental resource for a variety of educational experiences. This resource provides a variety of reproducible materials, allowing teachers to adapt the curriculum to the needs of their classroom experience. It includes lesson plans, syllabi (six-week, nine-week, and 18-week options), student text answer keys, learning activities, math skills activities, pre- and post-tests plus summative assessments for each chapter, case studies and parent resources. Digital streaming of video content provides 22 lessons with more than 3.5 hours of relevant and engaging instruction featuring a variety of presentation formats. 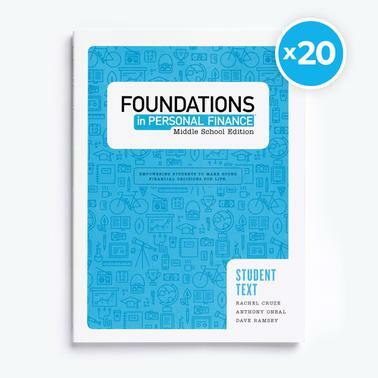 The Foundations in Personal Finance: Middle School Edition Student Text is an engaging 144-page softcover consumable. The six chapters include 22 lessons with plenty of opportunities for pre-teaching, teaching, reflection, application, review, learning extension, and both formative and summative assessments. The student text is aligned with state and national standards for financial literacy. This bundle includes 20 softcover student texts.